Once upon a time in La La Land there lived around four million people, a statistically accurate number of whom were regularly asked for their opinions by polling companies. However, bad fairies interfered with their judgement and the results and the media who reported on them so that they never accurately represented reality. And because the popular and competent people who believed in the law of common sense knew that was the case they were able to carry on ruling happily ever after. Rolls down, schools to close? The wholesale closure of rural and provincial schools by then Education Minister Trevor Mallard was a major contributer to the Labour losing so much support in the provinces at the 2005 election. By then the government had put a moratorium on school closures, but it was too late. Children were having to travel much further to school, classrooms were overcrowded, communities which lost schools also lost their focus and those affected made their feelings clear at the ballot box. Because of that the ODT headline Southern school rolls to plummet will have been greeted with no enthusiasm at all by the government.
. . . the number of 3 to 4 year-olds will decline in the Waitaki (-0.4%), Dunedin (-2%), Southland (-2.7%), Clutha (-5%) and Gore (-8.8%) territorial authorities between June this year and 2011 . . . The drops contrast with a predicted nationwide rise of 9.4% in the number of pre-schoolers. New Zealand Principals Federation president and Balclutha School principal Paddy Ford said Otago and Southland schools needed to take heed of the figures. Talk of school closures usually produces more heat than light and it is often those who no longer have pre-school or school age children who protest most strongly. Those whose offspring are at or nearly at school tend to look at what’s best for the children and sometimes that means school closures and amalgamations. Schools can reach a tipping point because when the roll drops so does the number of teachers. Parents then decide their chidlren are better off at a bigger school even if it means longer on a bus to get there and the roll drops further until the school is no longer viable. The concern in rural areas though is that roll projections based on birth numbers don’t necessarily reflect the reality, especially if there is a lot of dairying which has a big change in staff at the end of one season and start of another. Some schools have more than a 30% change in their rolls over Gpysy weekend at the end of May and a few families moving in or out of a school catchment can have a big impact on pupil numbers. While schools can provide a focus for a community that’s not a reason to keep a school open if a roll decline means its no longer meeting the educational needs of its pupils. The difficulty is that the Ministry has to work on historical figures and projections which don’t always paint the whole picture. However, if the projections are accurate, Paddy Ford says declining rolls wouldn’t be all bad news because there is a shortage of teachers. And while the projections for some southern districts are for falling rolls, huge increases are forecast for the Queenstown Lakes (29.7%), Central Otago (14.2%) and Invercargill (11.4%) areas. The number of public relations, communications, media staff and contractors employed by government departments has grown by at least 112% in the past six years. Gerry Brownlee says in a media release that there were 238 people employed in these areas six years ago. That had grown to 448 last year and then to 505 by July this year. Among the increases in the amount paid in salaries Brownlee noted was the Department of Conservation which laid field staff off this year but increased its spend on PR salaries from $560,000 in 2006/7 to $1,100,000 in the 07-08 year – a 96% increase. The Ministry for the Environment had an 88% increase, from $580,140 to $1,092,484; and Inland Revenue salaries doubled from $913,909 $1,828,476 in the same period. One of the few good things to come out of the Electoral Finance Act was a very clear warning to government departments that they can’t be doing anything that could be construed as singing the praises of the Labour-led government so what on earth are all these people doing? I doubt if it’s telling us what we have a right to know because journalists reckon there is an inverse relationship between the number of PR people in an organisation and the ability to get clear, honest and open communication from it. How’s this for another example of EFA silliness? 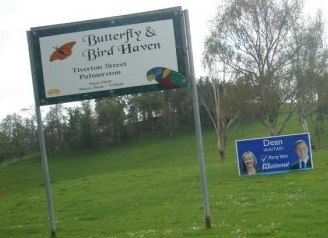 The tall metal frame supporting the sign about the bird and butterfly haven belongs to the National Party’s Waitaki electorate. What was then the Otago electorate bought lots of them years ago. The electorate committee has leased them to campaign committees for a few weeks before each election and the cost of that has been accounted for in the election return. In between elections the people who own the land on which the frames stand let other organisations use them at their discretion. But this year is different because under the EFA if we use the frames we can’t account just for the cost of leasing them we’d have to account for the full commercial value of the materials. That would be several hundred dollars per frame which multiplied by several across the 35,888 square kilometres of the electorate is far too much when the most we can spend is $20,000 inclusive of GST. So the bird haven sign stands in splendour on our frame and the hoarding is propped near by on the cheapest materials we could find. Dalylight saving began in most of Australia today which brings most states back to two hours behind New Zealand. Clocks in New South Wales, Victoria, Tasmania, ACT and South Australia went forward an hour this morning. Western Australians sensibly wait until the end of the month to adjust their clocks and neither Queensland nor the Northern Territory observe daylight saving. Inquiring Mind asks several questions of Fonterra. in the wake of the melamine milk poisoning in China. What is Fonterra’s policy on advertising infant milk formula? Does it have different policies in different countries? Does it know if San Lu, in which it has a 43% stake, was one of the Chinese companies which contributed to the $765 million spent on advertising baby milk formula in China last year? Nestle and Mars branded snacks made in China have been recalled in South Korea after melamine was detected in samples. The Korea Food and Drug Administration says the industrial chemical has been found in M&M’s and Snickers peanut Fun Size, both produced by Mars in China. Kit Kat bars from Nestle were also found carrying melamine, bringing the total number of melamine-detected items to 10 in Seoul. The report doesn’t mention whether the amounts of melamine detected were at dangerous levels, but given the deaths and illnesses in China recalls are a sensible precaution. You are currently browsing the Homepaddock blog archives for the day Sunday, October 5th, 2008.